Business class seat in a Lufthansa Boeing 747-400. Control screen fixed to an economy class airline seat (Thai Airways International Airbus A340), the tray is stowed. An airline seat is a seat on an airliner in which passengers are accommodated for the duration of the journey. 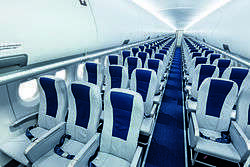 Such seats are usually arranged in rows running across the airplane's fuselage. A diagram of such seats in an aircraft is called an aircraft seat map. On the oldest of planes, seats were armchairs which stood loosely in the cabin, but movable furniture in the aircraft is a safety hazard, and seats are now fastened to the floor. However, airlines usually want the flexibility to move seats around or remove them, so the seats are attached to rails underneath the floor which run along the aircraft fuselage. If the airline wants to reconfigure the seating, this is a minor operation. For passenger safety, airline seats are equipped with seatbelts, and there is a "Fasten Seatbelts" sign above each seat which is lit up when passengers are expected to remain seated with the seatbelt fastened. This is during taxiing, take-off and landing, although turbulence may also prompt the captain to turn on this sign. Seat pocket containing safety card, magazines, and airsickness bag. Seats are frequently equipped with further amenities. Airline seats may be equipped with a reclining mechanism for increased passenger comfort, either reclining mechanically (usually in economy class and short-haul first and business class) or electrically (usually in long-haul first class and business class). Most aircraft also feature trays for eating and reading, either in the seatback which folds down to form a small table in most economy class seats, or inside the armrest which folds out in most first class, business class, bulkhead, and exit row seats. Most airline seats also feature a pocket which may contain an in-flight magazine and safety instructions. On small and short-haul aircraft, or on low-cost carriers, some of these amenities may not be installed. For instance, on several aircraft, Ryanair has installed non-reclining seats without seat pockets with the safety manuals stitched to the seat back instead. Even on airliners with reclining seats, some seats may have a restricted recline or no recline. Typically this will be the rear row of the cabin where a rear bulkhead blocks the recline, or seats immediately in front of the emergency exit where a reclined seat might restrict access to the emergency exit, creating a potential safety hazard. Independent seat review sites such as SeatGuru often warn passengers against these seats. During take-off and landing the crew ask passengers to put their seats in an "upright" (unreclined) position and to lift and stow their tray tables. Seats may be equipped with power ports (either EmPower, AC, DC, or USB power-only sockets) for small electrical appliances and ports for headphones for the audio entertainment. 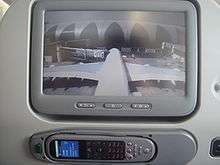 Some airlines also place TV-screens in the back of each seat as part of the In-flight Entertainment system on long-haul aircraft. Most long-haul aircraft (and short-haul aircraft on some airlines) feature seats with adjustable headrests in all classes, allowing the passenger to adjust the headrest for comfort. Electrically adjustable lumbar support is found on most long-haul first class and business class seats. Rarely, economy class may also include a mechanically adjustable lumbar support on some long-haul aircraft. However, with the trend towards slimline seats in economy class, this amenity has mostly vanished from most new economy class seat installations. Some business class seats, such as the Recaro CL 4420, have a built-in massaging feature. Some business class cabins feature seats that recline to a sloped flat position. These "lie flat at an angle" seats allow for greater comfort than traditional recliner seats, but are less comfortable than fully horizontal flat bed seating. Most international first-class and a growing number of international business-class cabins feature seats which recline to a full-horizontal flat position, forming a bed. Some airlines are now introducing new "slimline" seats in economy class. These seats, in addition to weighing less, theoretically allow airlines to increase capacity without significantly affecting passenger comfort. Many passengers however, have expressed displeasure with these seats. Moreover, the Department of Transportation (DOT) has begun to explore the safety issues associated with increased aircraft capacity and reduced seat pitch that results from the installation of "slimline" seats. In an April 14, 2015 hearing of the DOT's Advisory Committee for Aviation Consumer Protection, Cynthia Corbett, an investigator for the Federal Aviation Administration (FAA) Civil Aerospace Medical Institute, discussed concerns regarding the emergency evacuation of higher capacity aircraft. This type of seat was pioneered by Recaro, but several other manufacturers (such as Weber Aircraft LLC and B/E Aerospace) have introduced their own slimline seats as well. These seats may or may not feature moveable headrests, and generally do not feature adjustable lumbar support. Slimline seats are being further refined, with monospar chassis seats now available from Acro, liberating ever more passenger space. A newer innovation by Zodiac Seats U.S. (formerly Weber Aircraft LLC) is an articulating seat bottom, where the seat bottom moves forward in addition to the seat back tilting backwards. Examples of airlines that have introduced such seats to some of their aircraft include Aer Lingus, Delta Air Lines, Emirates, American Airlines, and Avianca. This feature was eventually adopted by competitors such as B/E Aerospace and Recaro. Airline cabins are frequently classified as narrow-body if there is a single aisle with seats on either side, or wide-body if there are two aisles with a block of seats between them in addition to the seats on the side. The number of seats abreast is affected by the aircraft width. On very small aircraft such as the Beechcraft 1900 there are only individual seats on each side of the aisle (1+1 seating). The widest narrow body aircraft such as the Airbus A320 family and Boeing 737 aircraft have six abreast seating in a 3+3 layout. Asymmetrical layouts also exist, examples including the Embraer Regional Jet which has 1+2 seating while the Douglas DC-9 and Sukhoi Superjet 100 aircraft typically feature 2+3 seating. On wide body-aircraft the center block of seats between the aisles can have as many as 5 seats on planes like the layout on most McDonnell Douglas DC-10 and some Boeing 777 aircraft, although Boeing recommends the 3+3+3 over the 2+5+2 layout. Very wide planes such as the Boeing 747 or the Airbus A380 have ten seats abreast, typically in a 3+4+3 layout, although this layout is also sometimes used as a high density layout on aircraft normally seating nine abreast, such as the 777 or DC-10. Recently, airlines have been adopting ten abreast seating on the Boeing 777-300 aircraft. While there are some exceptions, most commercial aircraft seats are forward-facing and on military aircraft seats are frequently rearward-facing. Southwest Airlines previously offered a few rearward-facings seats on some aircraft but that scheme has now ended. Rearward-facing seats are also common on business jets, to provide a "conference" type layout. British Airways, United Airlines and American Airlines also have rearward-facing seats in their Club World, (select) United BusinessFirst (Intercontinental Business Class) and (select) Business Class Cabins, respectively. It has been argued that rearward-facing seats are safer because in the event of a crash, the sudden deceleration will propel the passenger into a rearward-facing seat instead of out of it, meaning the force is distributed over the entire seat back, instead of the straps of the seat belt. The argument against such seats has been based on passenger comfort, safety and cost. It could be argued that passengers who desire the natural layout of forward-facing seats may be uncomfortable with a rearward layout. On the safety aspect, the argument has been that during a plane crash, debris, such as luggage, will fly forward in the cabin, quite possibly into the passengers in rearward-facing seats. On the cost aspect, rearward-facing seats need additional strengthening which adds extra weight and therefore higher fuel costs. Many airlines provide maps of their seating configurations on the various aircraft they fly. SeatGuru shows seat maps for a wide range of airlines and aircraft, along with descriptions of the best and worst seats on the aircraft. Window seats are located at the sides of the aircraft, and usually next to a window, although some aircraft have seat rows where there is a window missing. Window seats are preferred by passengers who want to have a view, or a wall which they can lean against. Passengers in seats adjacent to the aisle have the advantage of being able to leave the seat without having to clamber over the other passengers, and having an aisle they can stretch their legs into. If a seat block has three or more seats, there will also be middle seats which are unpopular because the passenger is sandwiched between two other passengers without advantages of either window or aisle seats. Middle seats are typically booked last. When evaluating the size (and comfort) of a seat, the main terms used are pitch and width. It is reported in 2016 that the average distance between seat rows has declined to 79 centimetres, from over 89 centimetres, while the average seat size has shrunk to 43 centimetres from 46 centimetres in the previous two decades. Deep vein thrombosis(DVT) affects one in 5,000 travellers on long flights. DVT is the third most common vascular disease next to stroke and heart attack. Seat pitch refers to the space between a point on one seat and the same point on the seat in front of it. For many carriers, the pitch in Economy class is 29 to 32 inches (74 to 81 cm). More seat pitch can mean more legroom, but legroom is also affected by the thickness of the seat back. Airlines have claimed that a reduction of seat pitch can be compensated for by a thinner seat-back design. American Airlines' business class seats in their Boeing 767-200s, which are now retired, were 62 inches (160 cm), the largest in any short-haul business class. US Airways', which has now merged with American Airlines, first class flatbed seats in their Airbus A330-300s have a seat pitch of 94 inches (240 cm). 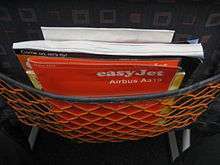 The seat pitch on low cost carriers can be as low as 28 inches (71 cm) in the case of Spirit Airlines but is typically either 29 inches (74 cm) or 30 inches (76 cm). Seat width is the distance from armrest to armrest, in Economy class this is typically around 43-46 centimeters (17–18in). In 2013, Airbus said, for long haul flights, there should be an industry standard for a minimum seat width of 18-inches in economy cabins, but its rival Boeing argued it was up for airlines to decide. People get bigger as a result of change in diets, the weight of the average American male in his 40s has increased by 10 percent between the early 1970s, when the Boeing 747 defined modern long-haul travel, and the turn of the century. The narrower 17 inches wide seat favoured by Boeing is a legacy from the 1950s when passenger jets were first introduced. In the 1970s and 1980s with the introduction of the Boeing 747 and the first Airbus jets, 18-inches become standard for long-haul flights. Seats were widened to 18.5 inches with the Boeing 777 in the 1990s and A380 superjumbo in the 2000s. Many airlines are adopting lighter 17-inch-wide seats on their Boeing 777 and 787 and 18-inch seats for A350s. Although for almost 20 years, the standard setup in the back of a Boeing 777 was nine seats per row, in 2012 nearly 70% of the biggest version of that plane were delivered with 10-abreast seating. When Airbus introduced its A380, it offered 10-abreast seating, giving each passenger up to 19 inches of hip space. In 2013, ten airlines fly Airbus A330 with nine 16.7-inch seats in each row, rather than the eight it was designed for. A research commissioned by Airbus shows an extra inch in seat width improves sleep quality by 53 percent. Costlier leather seats are used in Biman Bangladesh Airlines' Boeing 737-800 (S2-AFL tail). Besides adding luxury, two main reasons of using leather seats are because it is easy-cleaning and to prevent soaking of spilt liquid through padding. Airline seats are designed to be lightweight, but at the same time strong and fire resistant, while also taking into account passenger comfort. A typical design is an aluminium frame with blocks of polyurethane foam attached to it. In some cases a layer of fire-resistant fabric, for instance Kevlar or Nomex goes over this, and at the top is a layer of cloth or leather. Leather seats are more costly than traditional cloth seats. Even so, several airlines, including some low cost carriers, choose leather not only to present a more "luxurious" product, but also because such seats are easier to clean and prevent spilt liquids from soaking through to the padding. In the fairly early days of aviation, airline seats were typically of earthy and soft colors such as light browns and gray, which were intended to calm the passengers. During the 1970s, brighter colors such as red and orange became more commonplace. After this, shades of blue and gray, with a more business-like tone, became the most common choice. However, certain airlines such as Austrian Airlines, Emirates and Singapore Airlines still use soft colours on seats. Passenger signs, lights, and vent nozzles on a Bombardier CRJ200. The speakers are ahead of the seat belt lights in this perspective, and the attendant call button is the oval button ahead of the reading lights. The arrangement of controls, lights and nozzles on a Boeing 737. The seat belt light is immediately in front of the nozzles. An air-conditioning nozzle that can be tilted, swivelled, and adjusted by the passenger to either induce or reduce the output. This feature is found on most narrowbody aircraft, but many airlines have chosen to omit them on many newer widebody aircraft (such as the Boeing777). A reading light (often very similar in appearance to the nozzle) that can be turned on by the passenger for extra light, especially when the main cabin lights are turned off. 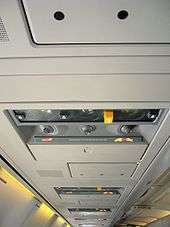 The buttons to turn the lights on and off are usually located directly on the overhead console on most narrowbody aircraft, while on most widebody aircraft, the buttons are usually found together with the in-flight entertainment controls, generally located on the armrests, on seat backs, or through the touch screen interface on some personal televisions. A call button, that, when pressed, alerts an attendant on board to serve the passenger(s)in the row with the pressed button (the attendant is directed by a small light on the console and alerted by a quiet audio signal). As with the reading light buttons, the call button is usually located directly on the overhead console on most narrowbody aircraft, while they are found together with IFE controls on most widebody aircraft. At window seats there are window shields for protection from sunlight. They have to be slid up during landings and takeoffs by ICAO regulations and/or law. This rule is in place to provide visibility into and out of the aircraft during emergencies. Some airlines also require passengers to keep the window shields down on long-haul flights for a certain period of time (with a corresponding decrease in cabin lighting), in order to allow passengers to sleep more easily. The Boeing 787 Dreamliner uses new electrochromic windows instead of traditional window covers. Many armrests provide devices for reclining the chair, control interfaces for in-flight entertainment systems and ashtrays — although smoking is now prohibited on board aircraft by most airlines. 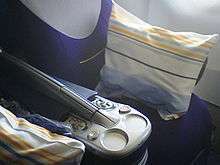 Wikimedia Commons has media related to Aircraft seats. ↑ Airline explores tolerance for frill-free flying, Desert News, March 18, 2016. ↑ Upright position of Seat Backs, FAA safety bulletin, USA. ↑ Weber 5751, Weber Aircraft LLC. 1 2 The Shrinking Airline Seat, The Independent Traveller.com. ↑ The Incredible Shrinking Plane Seat Wall Street Journal, October 23, 2013. ↑ J.T. Bushnell, Flying backward, flying safer, Mail Tribune, Southern Oregon, USA, August 2001. Archived December 14, 2006, at the Wayback Machine. ↑ Window Or Aisle? CBS News, July 4, 2003. 1 2 3 Marchitelli, Rosa (30 May 2016). "Air Canada passenger suffers 'horrible pain' after being stuck in cramped seat". CBC. Retrieved 30 May 2016. ↑ "Short-haul First/Business Class Comparison Chart". SeatGuru. Archived from the original on 30 November 2009. Retrieved 28 November 2009. ↑ "Long-haul First Class Comparison Chart". SeatGuru. Archived from the original on 14 November 2009. Retrieved 28 November 2009. ↑ Mutzabaugh, Ben. "Spirit Airlines adds non-reclining seats to new planes". USA Today. Retrieved 22 April 2010. ↑ The Chair. St Petersburg Times, July 21, 2003. 1 2 3 4 "Boeing, Airbus feud over airline seat width". The Chicago Tribune. Reuters. 1 Nov 2013. Retrieved 30 May 2016. 1 2 3 4 5 6 Ostrower, Jon; Michaels, Daniel (23 Oct 2013). "The Incredible Shrinking Plane Seat". The Wall Street Journal. Retrieved 30 May 2016. ↑ Blue Skies, Time, July 30, 2001. ↑ History of Airline Design, Airliners.net.